How big of a spot in your home are you willing to give up? This article is about home aquariums, both freshwater and saltwater. Keeping up an aquarium is a great hobby! As well as being a great hobby it is great for the whole family. Tanks do not require tons of space. You can have a tank without giving up most of you home to the hobby of owning one. Fish will not bother you. Unlike dogs fish will not be constantly barking and fish do not require training. Money: How much are you willing to spend on the aquarium? 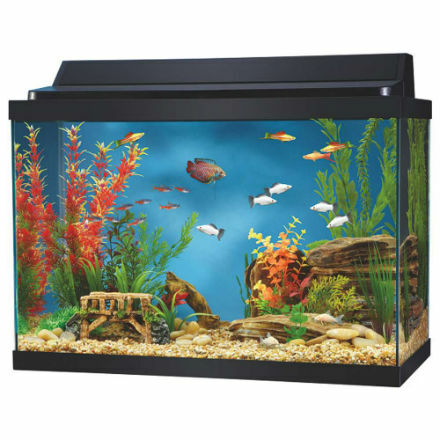 Type: Of Tank Will you have a salt or freshwater tank? Size: How big is your tank? The more you know about your aquarium the better. If you where like me when you first started a fish tank you probably did not know much about your tank. It is important to talk to the people at your local petstore and research online. Petsmart and Petco offer great customer support with their aquariums. Also many local stores will give you tips and tricks for your aquarium. Make sure that you know the fish before you put it in the tank. Some fish do better in groups, pairs, or even just by themselves. Also some fish just do not get along with fish of another specie. Before purchasing a fish for your aquarium talk to the people selling the fish and see what other fish can go along with it and also see how many fish you can fit in your aquarium. Saltwater usually look more colorful and are typically harder to care for. Freshwater fish are smaller, colorful, and generally easier to care for. If you are inexperienced in fish care you should defiantly go for a freshwater aquarium. The fish are cheaper, easier to care for and you will not have to do frequent checkups on the tank water and spend tons of money on treatments. If you do not have a ton of money go for a smaller tank. You may still be able to purchase the big one but once you buy fish, a filter, and other aquarium supplies the price adds up. Make sure that you know how big of a spot you are willing to give up before buying the tank. If you are fine with smaller fish then you will not need a large tank. Also if you do not want a large amount of fish you will not need to buy a large tank. A good rule to follow is one gallon per inch of fish. Once you purchased all your supplies you are ready to begin set up. Do NOT purchase your fish yet! You are not ready at this point to buy your fish. There you have it! Your tank is set up. Enjoy your new water world!